Lately not much has happened on the building front. Most of my shop time has been occupied by building a Go-Bar clamp and some other smaller jigs and fixtures. Apart from that, we've had an excessive amount of children's birthday parties to attend, not to mention Halloween. But, in the spirit of documenting this build I decided to take some pictures of my workshop last night. It's a two car garage that, like so many other garages here in Southern California, is not used for it's intended purpose, but more a place where you shove all the crap you've accumulated over the years and that you don't really have any use for anymore but somehow has gotten too attached to to get rid of, in. 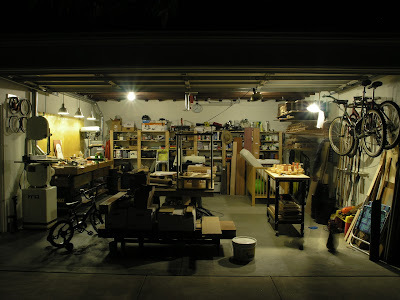 However, the garage has a small attic were all the really useless stuff has ended up, leaving the a fair amount of room for some tools and workbenches, and viola - a little workshop is born. Last summer I completed my main bench made from MDF and two Rockler Shop Stands. It has six drawers and a shelf underneath. My other bench is made from the 1½" thick maple butcher block sink cut-out leftover from our kitchen counter tops. Like the MDF bench it is supported by a Rockler shop stand. It is on wheels and can easily be moved around as needed. I drilled several holes into the top to accommodate Lee Valley's Bench and Wonder Pups Combos and the attachment of a Patternmaker's Vise. I also build a small dust collection system that is hooked up to my bandsaw. It has a port for a vacuum hose that doubles for the drill press, a floorsweep and an 'expansion' port that I can use to hook up a variety of other tools to. At the moment 'the other tools' only consist of a drum sander but in the event that more tools enteres the shop, this is where these would go. Unfortunately the floorsweep is not very useful as bigger shavings from handplanes and the like just clog up the whole system. The port where the vacuum hose goes does not have very much suction, which I hope is due to the drastic and likely improper installation of a 4" to 1½" reducer. I hope to be able to fix this by adding a small cyclone seperator to it instead. This could potentially also take care of the inadequacies of the floorsweep; All projects for a later date. The shelves on the back wall are cheap IKEA shelves.